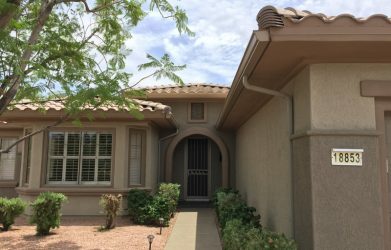 When home-owners run through their home protection checklist they more often than not completely overlook the importance of rain gutters, especially in a hot and dry climate like Arizona, after all it never really rains here, right? Each year as monsoon season approaches the Booth Built team set out to break some myths and raise awareness of the importance of a well installed guttering system for your home. With many years of experience installing gutters across the valley we have seen first hand over and over again how important they are for protecting the foundations of your home to avoid damage and costly bills later on down the line. In fact, each year the monsoon season brings torrential downpours that wreak havoc on roof fascia board and foundations across the valley. No gutters leads to poor drainage on your property – the most common reason for foundation damage! A well installed guttering system creates an efficient flow of water, channeling it away from your home, protecting the roof fascia, and avoiding any water pooling around the vulnerable foundations, an extremely important structural component of your home. Times have changed! Gutters are now designed to minimize the need for you to get up the ladder to clean out debris. This new technology makes gutters a no-brainer. At Booth Built we work with the latest in guttering design, using materials that require little to no maintenance, pre-coated to ensure strength and durability. Also it is quick, cheap and easy to set up a water catchment system that will collect rainwater from your gutters for use in your garden, saving you time and money. Believe it or not there is now such a thing as seamless gutters! These gutters are expertly designed to divert and organize the water with no unsightly seams to catch debris or look ugly on your home. And there are so many colors to choose from that you are sure to find a look that truly complements the existing design of your home. You can even select gutters that are made from alternative materials like copper, adding a new design element to the architecture of your home. When the monsoons come and the water flows make sure you are set up with a guttering system installed correctly that efficiently channels water away from your home, preventing damage and costly bills later on.